Here’s a nice treat for P-40 fans. It begins with a brief history of the P-40 series and a “Kittography”, then provides six pages of colour photos of a restored P-40N showing a great deal of detail. Next comes the first build, a P-40B of the American Volunteer Group – the Flying Tigers - at Master level by Steve Palffy. This is the Trumpeter 1/32 scale kit, with a lot of detail added to the engine, cockpit and the interior of the rear fuselage so it can be shown with servicing hatches open. Next is a 1/48 scale Kittyhawk Mk IA of the RNZAF, by Brett himself at Advanced level. Here he uses the ProModeler P-40E, correcting the fit of the cockpit and dealing with some detail points to build a better model. This model has been painted and weathered by Chris Wauchop. Then there’s another 1/48 build, this time a Kittyhawk Mk IV by Brett from the AMT P-40N kit and again at Advanced level. This one uses a True Details replacement cockpit and Eduard etched parts as well as some scratchbuilt details. A third 1/48 build at Advanced level comes next, by Brett and producing a French P-40F from the AMtech P-40F. Here he deals with the installation of the resin front fuselage provided by AMtech to modify the original plastic fuselage. The fourth 1/48 build is at Master level and also by Brett, converting an Eduard Profipack P-40N to the TP-40N two-seat trainer version. He modifies the cockpit opening and adds the second cockpit with a “spares box” resin floor and sidewalls plus a lot of scratch building – some modellers might prefer to use the True Details P-40N cockpit but the process will be much the same. The final build is by Glen Porter at 1/72 scale and at Advanced level, producing an RAF Desert Kittyhawk Mk !a from the Academy P-40E. This one uses the True Details 1/72 scaleP-40E - N cockpit plus a Hasegawa windscreen and canopy to replace the inaccurate one in the kit. To end the book there are a good list of reference books and websites dealing with the P-40 series and the expected page of colour “chips”. All the processes of building these models are very well described and shown in plenty of photographs, so no-one should have any problem in duplicating the work. The colour schemes chosen are all very interesting as well, with the weathering techniques used by each modeller set out for readers’ benefit too. 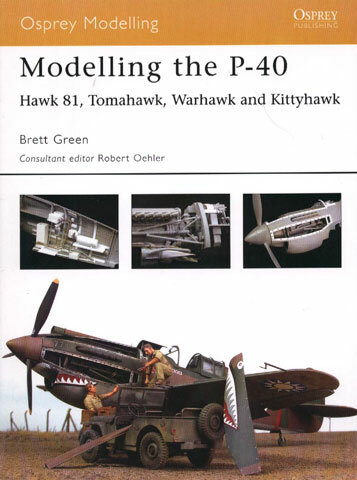 Highly recommended to all P-40 fans!